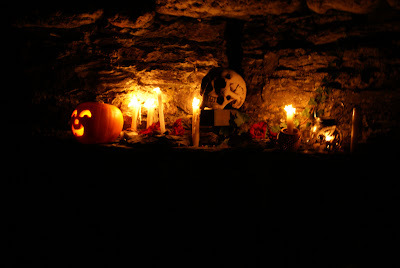 Some historic treats for All Saint's Day, Samhain, Halloween, etc. Soul cakes originated in ancient Europe. They were handed out by folks during the day and upon evening they were placed upon the resting places of deceased ancestors to ease relief to the souls. These were gifts to the poor and needy in exchange for prayers for those who have recently passed. In modern times, they have become Halloween treats to hand out to those who show up at your door. 1) Grease an 8-inch square baking pan and set it aside. If you don't have an 8-inch pan, you can use any pan with dimensions that add up to 32 inches. This is the measurement of the amount of space you will need for the amount of cake mixture you are making. 2) Preheat your oven to 350 degrees F before you start to Make All Saints Day soul cakes. 3) Melt the butter and molasses in a pan over a low heat. This mixture will burn if left too long or melted over high heat. 4) Remove the mixture from the fire when melted and stir it once in a while to prevent clumps. 5) Mix the flour, oatmeal, ginger, salt, brown sugar and the cream of tartar in a large bowl. Set this bowl aside for now. 6) Mix the milk and baking soda in a separate bowl. Mix slowly with a fork to avoid creating froth in the mixture. 7) Pour the butter and molasses mixture into the bowl of dry ingredients. Mix this thoroughly with a fork until the mixture starts to stick to the sides of the bowl. 8) Pour in the milk and baking soda mixture. Continue to mix everything with a fork to be sure it all blends in together. 9) Place the sticky dough into your greased pan. 10) Place the pan in the center rack of your oven and leave your cake to bake for about an hour. 11) Check the cake after about 45 minutes. Stick a toothpick in the middle to see how it is progressing. If the toothpick comes out dry, your cake is done. 12) Remove the pan from the oven and set it in a safe place to cool. 13) Take the cake out of the pan and slice it into several pieces. 14) Garnish your cake slices with powdered sugar or butter and a sprinkling of brown sugar and cinnamon. Serve. You can garnish your soul cake with other ingredients of your choice. For instance, you can try powdered sugar over sliced fruit in a light syrup. Purpose: Samhain (which is supposed to be pronounced sow-en, though some modern Pagans pronounce it as spelled) is the most important holy night of the year. In fact, it is considered the Celtic New Year. It is believed to be the evening in which the veil between the realm of the living and the dead is thinnest, allowing members of the spirit realm to walk the earth in great numbers. It is thereby considered the evening where our loved ones who have gone over to the other side of the veil are honored with a special feast. This is certainly the reason All Saint's Day was created by the Roman Catholic Church to celebrate honored individuals who have passed on, as well as the similar All Souls Day, which honors the memories of our individual loved one's who have passed on. The association with spirits of the dead walking the earth, as well as faeries and other etheric beings roaming the material plane in large numbers that evening, is probably the basis for the modern Halloween's emphasis on ghosts and goblins, and the popular stereotypical image of the witch as a swarthy old crone with green skin was derived from negative images of real witches as being corrupt harbingers of evil or mischief. The jack o' lantern, a still popular decoration, is derived from the image used by ancient Pagans to keep unwelcome spirits from the hearth during the celebration. Calls to your ancestors and loved ones for assistance is appropriate for those practicing spell work on this day, as is spell work for endings and calling upon the Crone aspect of the Goddess. The God symbolically dies of old age at this point, though the Mother Goddess is now pregnant with the reborn Sun God in her womb. This story caught my attention running on the Huffington Post.... Now, I am not in total agreement with what all The Post had to say about this, but I do agree that it certainly looks like maybe the folks of these recent, ongoing and spreading protests, may well have reached the point that George Carlin did in the not too distant past. I am sharing his video here and I think you can see where the Nation may be heading and what these protests are actually all about. I do wish that George was still alive to see these protests taking place. Caution: Do not view the video if you are sensitive to harsh and vulgar language.